Against the Grain Theatre (AtG) opened Claude Vivier’s Kopernikus: A Ritual Opera for the Dead on Apr. 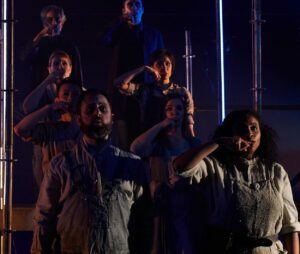 5 at Toronto’s Theatre Passe Muraille in a staging that featured a multi-disciplinary ensemble, roaming orchestra, and some very moving music. The work is one of the most performed Canadian operas outside of Canada, but AtG’s production aims to bring it back to its composer’s homeland. There isn’t so much of a story in Kopernikus as there are a series of scenes and ideas. The introduction of Agni, a recently deceased woman who’s entered the realm between life and death, is the catalyst that sets the wandering figures into motion. Agni is guided by several mythical and historical figures, including Lewis Carroll, Merlin, Mozart, and Tristan and Isolde, among others. As she learns the rituals and progresses through the underworld, she becomes more involved with the spirits until they are all able to ascend to whatever phase comes next—a beautiful moment signaled by a door in the upper level opening and a bright light welcoming the entire ensemble. Danielle MacMillan presents a charming Agni, who begins her journey in a state of beautiful otherness; visibly confused and separate from the ensemble. Her clear mezzo-soprano copes well with the role’s vocal demands, and her body language brings a great depth to the character. Upon entering the underworld, she is an outcast, mocked by the other women (Anne-Marie MacIntosh, Jonelle Sills, Krisztina Szabó), who provide strong vocal performances throughout the show. Eventually, MacMillan’s Agni is able to understand and contribute to the ritual, allowing for the entire cast of characters’ departure into the light. Portraying Lewis Carroll, a challenging role written with a high baryton-martin in mind, Bruno Roy served as a sort of narrator and primary guide to Agni. Roy’s ability to expertly traverse everything from high falsetto to low tones, often with a sweeping, glissando movement, added an aspect of unease to the character. Despite this, and Roy’s intense facial expressions, the portrayal never felt sinister—rather, he shows Vivier’s Lewis Carroll as the fantastical individual with whom many are familiar. Another standout was Alain Coulombe’s Merlin, with his deep bass offering gorgeous layers to the ensemble singing. One particular moment that heightened the duality of the staging was Coulombe’s use of a series of small bowls and grinders as bells, tying in nicely to his magical character. 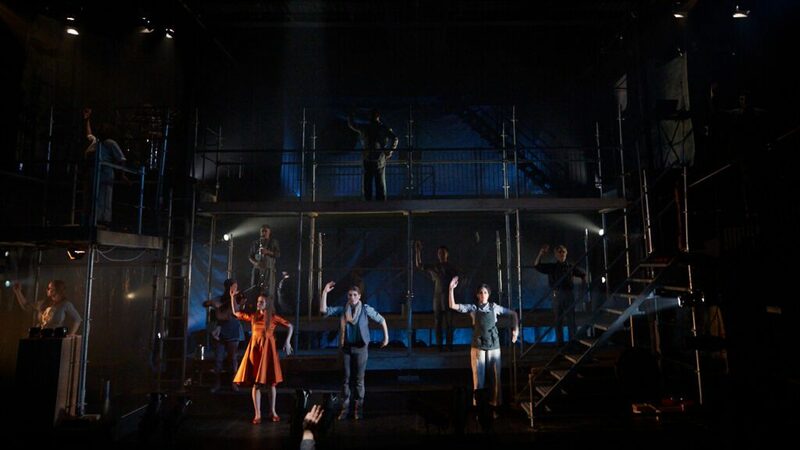 Many aspects of the production, including stage, cast, and props have multiple purposes, allowing for simple staging with highly effective results. 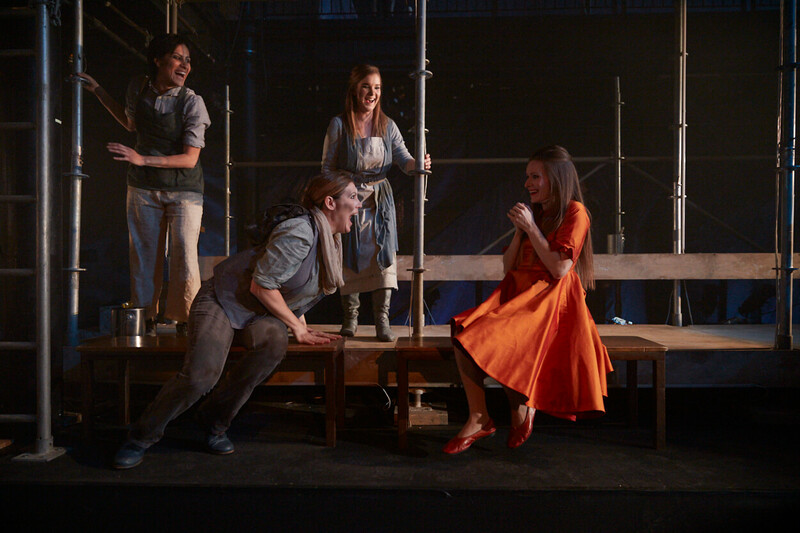 This production of Vivier’s Kopernikus holds true to AtG Founder and Artistic Director Joel Ivany’s 2017 staging of the show at the Banff Centre for Arts and Creativity, with set and lighting designer Jason Hand utilizing the multiple floors of Theatre Passe Muraille’s main stage in addition to a large piece of scaffolding. Lighting is extremely poignant, with cool tones setting the environment of the underworld efficiently. The use of LED lighting along the rails of the scaffolding in the second part offers a welcome change to the visual environment. Vivier’s music relies on movement, both of the voice and of hands in various sound manipulation tactics—brushing fingers against lips and covering the mouth with hands were reoccurring techniques used by the singers to meet the work’s complex musical requirements. AtG Founding Member and Music Director Topher Mokrzewski does a wonderful job of aligning the small orchestra as they wander through the stage’s different levels, and the incorporation of arm movements and dancers is executed to great effect by Co-Director and Choreographer Matjash Mrozewski. As Agni’s silent, pseudo-guide and caregiver, Anisa Tejpar’s dancing and mime is sincere and emotive throughout. Vivier’s Kopernikus is a highly complex piece of music theatre, as performers sing in French and a made-up language of Vivier’s imagination. In this iteration, orchestra members perform without a score, and a multi-level set using ladders and fire-escape stairs add potential hazards for the performers given the low lighting. 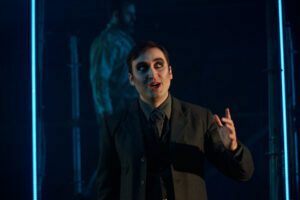 Despite these factors, Ivany and AtG have produced a highly-effective adaptation of Vivier’s work that respects its ritualistic and technical components in a way that should inspire interest in one of the most unique pieces in the Canadian opera catalogue.